The last day of school for the 2012-2013 school year is Friday, June 28! We had a great year, which included many new additions to our program. Since returning to EMH as a teacher and program coordinator, I worked to include more of my areas of expertise: science and health. It's been fun experimenting: sometimes the project is a huge success; other times, a massive failure. But it's always been fun. We also have been more involved in our community. We opened our parent workshops to any parent who is interested and had the opportunity to appear on local radio. Finally, we created this blog. This has been an exciting year and next year will be even more exciting - it will be our 20th school year!We hope you have a great summer and see you next school year! Add a touch of color and summer to your room! This craft is both simple and fun to make. It’s even easier to personalize. Within minutes, you can add a new decoration to your room. 1. Trace 3 different sizes of circles (small, medium and large)on 3 different pieces of construction paper. Cut out with scissors. 2. Glue all three circles on top of each other, with the smallest circles on top and largest circle on the bottom. 3. Using scissors cut small triangles out of the largest circle. 4. Cut a small piece of a plastic straw. 5. Tape the straw to the back of the flower. 6. Repeat steps 1-5 and string the flowers together with ribbon. 7. Hang up and decorate! Earlier today I had a great conversation about preschool education with Kevin Willett from the Friends of Kevin radio show. During today's conversation, we talked about a range of topics from EMH's history, common questions about the Montessori Method and preschool education, and our program in general. Please visit us again for a link to the interview. Today was EMH's 19th graduation ceremony! It was a fun event, celebrating the achievements of each child in our program, followed by a potluck lunch filled with lots of delicious food. You may be wondering, what is a preschool graduation ceremony? And, why even have one for children who are so young? These are some common questions that we hope to answer for you. Each school is different and preschool graduation ceremonies vary greatly between schools. Some preschools order graduation caps and gowns, while other schools, like EMH, are less formal and children wear their normal attire. Almost all schools, follow a similar formula: the graduation begins with a short student performance, then the children are awarded ribbons and certificates, and after families are invited for lunch. At EMH, the graduation program changes every year, depending on the ages and interests of the children enrolled. Some years, the children sing and dance to songs they enjoy and have special meaning to them. One year, the children dramatically acted one of their favorite songs. 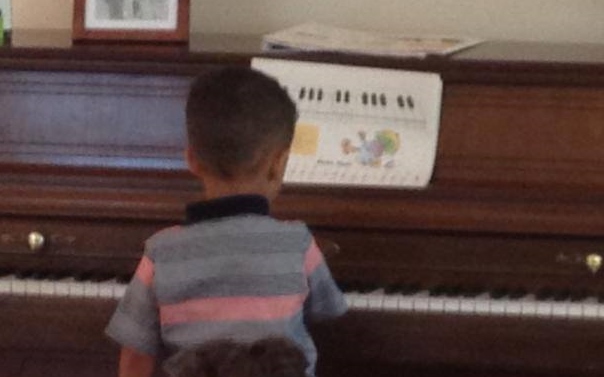 This year, each child preformed a song on the piano. 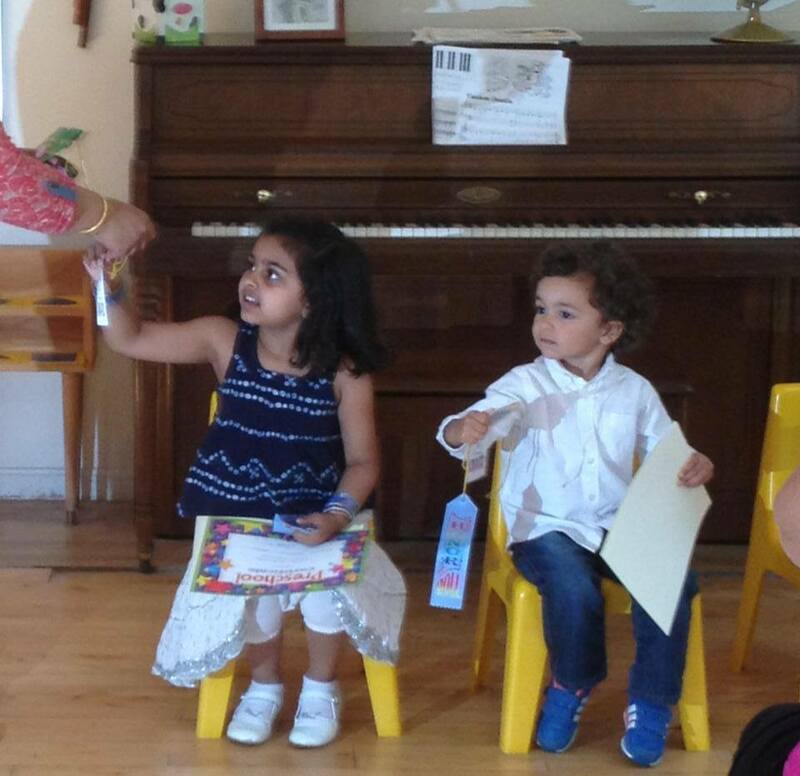 We hold our graduation ceremony on Saturday mornings, to make it more convenient for families attend. Normally, the graduation ceremonies are short, and the length of the potluck lunch depends our families. This year, although our class was small, the families who participated were great. We had a delicious lunch with even better conversation and the children had a great time eating and playing. Our students eagerly await graduation day. Some students, if they begin at age two and continue through to Kindergarten, graduate from preschool multiple times. However, each year they are excited for the ceremony: the children are proud of themselves and their work and look forward to receiving recognition for all they have achieved. When many people think back to their preschool years, all they might remember are fun and games. This is exactly what we want people to remember: that the process of learning is fun. However, because of the increased use of standardized testing at an early age, preschool programs, even play based programs, are more focused on academics. On top of teaching children the basics, many schools also now teach children how to complete school work; some preschools even assign homework. Personally, as a teacher, I see how much children grow and develop during the preschool years socially, emotionally, cognitively, linguistically and physically. Having a graduation ceremony teaches them to recognize their achievements and to be proud of all they have accomplished. At this morning's ceremony, I saw how proud the children were that they had learned how to play the piano. Playing for their parents was a big accomplishment for them. For children moving on to kindergarten or first grade, the preschool graduation ceremony can be an important milestone. Many children will soon begin riding a yellow bus to school when they start "big kid" school. These children are always excited a proud to be moving on to the next stage in their academic careers. At EMH, the graduation ceremony is a fun and laid back event that means a lot to our students. We always have a lot of food and a great time with our parents. Although the children may be too young to grasp what a graduation ceremony really means, they do deserve recognition for the achievements and are proud of what they have accomplished. Earlier tonight we held a parent workshop at our school on how to implement the Montessori Method at home. The parents from our school and wider community had some great questions about the Montessori Method and we had a lively discussion about what Montessori is and is not, and how easy it is to use at home. Parent workshops are an important part of a preschool program. Research demonstrates that when families and caregivers are involved in their child's preschool, their children do better in school, academically and socially. In fact, parent engagement has been defined as parents and school staff working together to support and improve the learning and development of children. Through our workshops, we hope that parents learn more about the Montessori Method, and can continue the learning process at home to support their child's learning and development. This goal is not limited to our school; our workshops are open to parents of children who are not enrolled in our program. We know the Montessori Method works and know that all children, regardless of whether they are enrolled in a Montessori school or not, can benefit from the Montessori Method. We know that our community is a part of our school. In fact, studies suggest that, when communities become involved in schools, they provide additional support to the children and teachers. Thank you to all the parents and caregivers who attended our workshop. We know that everyone has busy schedules and it can be difficult to attend these events and appreciate that you were able to join us. Powell, D. Families and Early Childhood Programs. 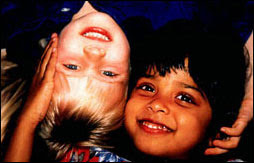 NAEYC: 1989. This craft is easy and fun to make and is slightly different from other flower crafts. You can make this flower as a gift: just assemble and place in a jar. 1. On three different pieces of construction paper that are 3 different colors, trace 3 circles of different sizes (small, medium and large). Cut the circles out with scissors. 2. Fold the large circle in half, 4 times over. 3. Using a pencil, draw the outline of flower petals. The outline should be only a curve along the outer edge. Cut along the curved line with scissors. 4. Glue the small circle to the medium circle. 5. With scissors, make small cuts along the edge of the medium circle. 6. Attach a green pipe cleaner to the large circle that has been cut to resemble a flower. 7. Glue the medium circle to the large circle. 8. On a green piece of construction paper, draw flower petals. Cut out the flower petals with scissors. 9. Glue the flower petal to the green pipe cleaner.